Clickhere2shop was founded on the belief that customers come first. As a result, we strive and maintain the most pleasant order and shipping experience possible. As a leading online retailer, we sell over 20,000 products, ranging from Electronics, Office Products, Pet Supplies to Furniture and more. Our products sell at the lowest price possible while maintaining excellent quality. We guarantee to deliver high standards for your shopping experience through innovation and first-class customer service. Order today, and see for yourself why shoppers love our incredible selection of high- line products. For customer service inquiries or to initiate a return, please contact Clickhere2shop at cs@clickhere2shop.com or 801-796-2496. You can initiate a return for new and unopened items within 30 days of delivery for a refund. To qualify for a refund, items must be in new and unused condition with all original materials and/or accessories. If a return is not received at our processing facility within 30 days, it may be subject to a partial refund. You will be responsible for return shipping costs. However, if the return is a result of a fulfillment error, product defect, or damage incurred during shipping, we will refund the full cost of the merchandise. We will provide a pre-paid return shipping label for Non-Buyer's Remorse returns. All returns are subject to inspection, and if found not to be an error on our part, the return shipping costs will be withheld from your refund. SPECIAL RETURNS INSTRUCTIONS: Once the seller approves the returns request, they will provide a Returns Merchandise Authorization. The Seller cannot accept returns for used items. The Seller charges a restocking fee of 20% that will be withheld from the refund. 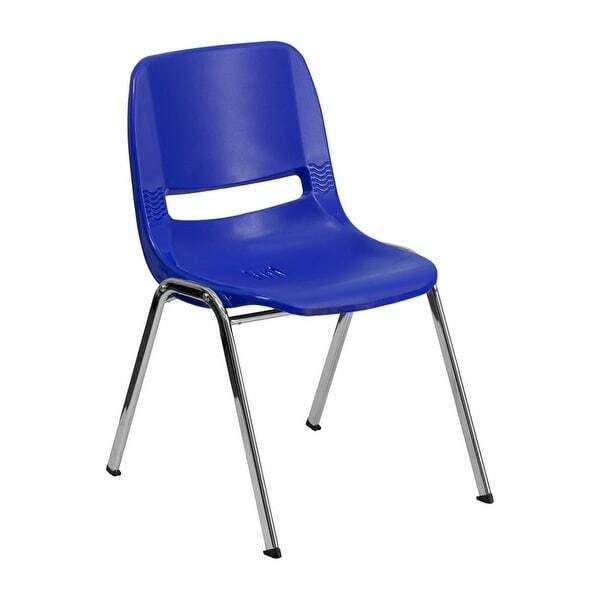 We consider this student stack chair to be the premier stack chair - essential for every school and classroom setting. This ergonomic stack chair provides a body molded, high impact plastic shell set upon a chrome frame. The comfort-formed back and contoured seat with waterfall front will give you complete comfort and lasting durability. Multi-Purpose Stacking Chair. 440 lb. Static Load Capacity. Stacks up to 15 Chairs High. Navy Injection Molded Plastic Shell. Vented Back allows Air Circulation. Supportive Dual Steel Cross Braces. Chrome Frame Finish. Plastic Floor Glides. Recommended for Grades K - 2. Assembly Required: No.Color: Navy.Finish: Chrome Metal.Material: Chrome, Plastic.Made in China. Seat Size: 13''W x 12.5''D. Back Size: 13''W x 13''H. Seat Height: 13.5''H. Overall Dimensions: 15.25''W x 19.25''D x 24.5''H. Dimensions 19.25 In. X 15.25 In. X 24.5 In.